Edward Nicholas born circa 1835 St Stephens, Cornwall, England, bapt. 4 August 1835 St. Stephens-in-Brannel, Cornwall, lived in Naseby, New Zealand and went to Tasmania about 1883, died aged 81 on 13 June 1917 at his residence in Queen Street, Invermay, and was privately interred at Carr Villa in Section C 113, married Mary Ann Sidebottom, died 5 July 1924, Invermay aged 85. She was privately interred with her husband. We hear that Mr Nicholas, photographer, has met with decided success since he came up to the [Blue] Spur, and has succeeded in making some remarkable "takes" which it is impossible to individualise. One, however, is so striking that we cannot forbear mentioning. A noted inhabitant is taken in his shirt and trousers, and has been taken to the life, the artist preserving his own reputation and the immaculate purity of the clean shirt. 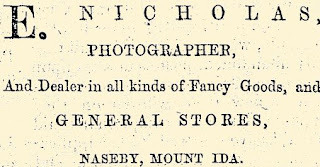 The 'Mount Ida Chronicle' reports the departure from Naseby of Mr E. Nicholas, who had resided in that district for the last 16 or 17 years. "We understand" says our contemporary "that it is Mr Nicholas” intention to go into farming operations, and the Gore district will probably be the scene of his new home, "Wherever he goes he will always carry with him the hearty wishes of a numerous section of the Naseby community." Mr E. Nicholas and family left Naseby for Invercargill on Tuesday morning, March 6th. 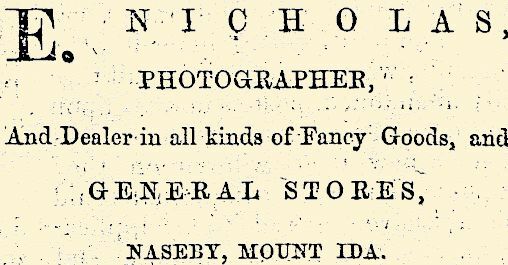 Mr Nicholas has resided in Naseby for the last 16 or 17 years, where he has profitably carried on the business of a general storekeeper. He also dabbled a little in agricultural pursuits. We understand that it is Mr Nicholas' intention to go fully into farming operations, and the Gore district will probably be the scene of his new home. Wherever he goes he will always carry with him the hearty wishes of a numerous section of the Naseby community.